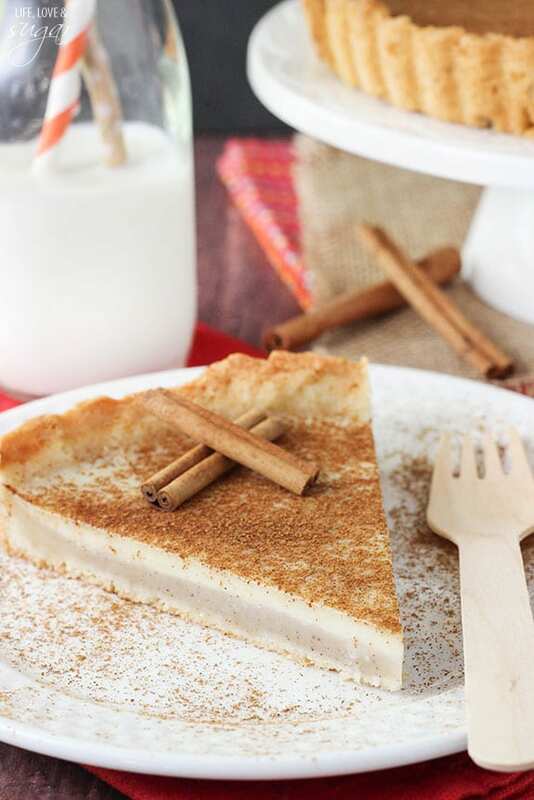 Milk Tart (also known as Melktert) is a traditional South African dessert. 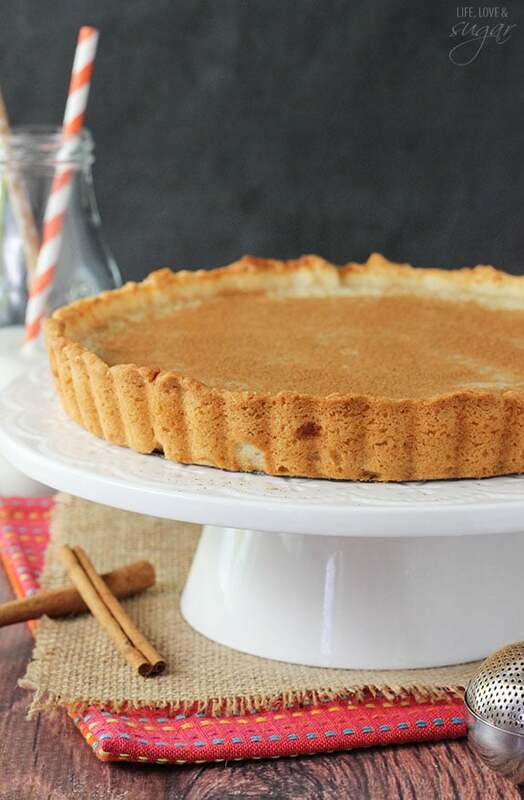 The crust is a soft, cakey crust topped with a cinnamon infused milk custard. It is delicious and was one of my favorites that we tried on our trip. Back when the hubs and I went to South Africa in May to visit his family, I naturally tried all the traditional South African foods and desserts I could. Not only do I like to try new foods, but I’d heard the hubs talk about so many favorite foods he had as a kid and I was so curious to experience them with him. I found milk tart to be a very common dessert option. The first night we arrived, we stayed with the hubs’ aunt and uncle and they served on for dessert. I love cinnamon, so naturally I was a fan. We had it at a few other places we stayed too, so I was excited to try a version at home. It actually took me many versions before I got it just right. Since it’s called a “tart” I was determined to make it in a tart pan. However tarts are fairly thin so several rounds were required to get the method right. To start, there’s the crust. It’s not like a pie crust. 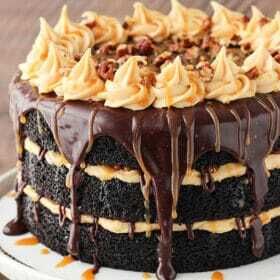 It’s more cakey. I actually love the crust. I just don’t love making it. Fair warning – while it’s totally worth it, the crust is the hardest part. The recipe for the crust doesn’t really make that much dough, but it expands quite a bit when it bakes. It’s also fairly sticky. Once you make the dough, you’ll probably want to flour your fingers to press it into the pan. It’ll seem like the dough won’t possibly be able to cover the whole pan, and it will be thin, but it will expand as it bakes and make a nice crust. You’ll only want it to go about halfway up the sides of the pan, because it expands up the sides. Cover the crust with aluminum foil that’s be sprayed with non-stick spray. I’d recommend adding some parchment paper on top of the foil, then adding pie weights. The pie weights are a must to keep the crust compressed. The parchment paper is a little stronger and allows you to easily lift out the pie weights after baking. The next step is the filling. It should come as no surprise that the primary ingredient is milk. The milk and vanilla are heated on the stove and brought to a rolling boil. Next, you want to temper the egg so that it doesn’t cook when combined with the milk. Beat the egg in a separate bowl, then pour a little bit of the heated milk into the egg and mix. Add the remaining milk and the rest of the ingredients and mix until well combined. The mixture will be very thin. To add the filling to the tart pan, I recommend placing the tart pan on the rack in the oven. I slid the center rack out, set the tart pan on it, then carefully poured in the filling. Because the filling is so thin, it can slosh around pretty easily if you pour it into the pan on the counter and then carry it to the oven. I found it easier to just fill the pan with it already on the rack. The tart bakes for about 25-30 minutes. The center will still be a little jiggly. Allow it to cool slowly on the counter for about 30 minutes, then refrigerate until cool. Sprinkle a little cinnamon on top and serve. 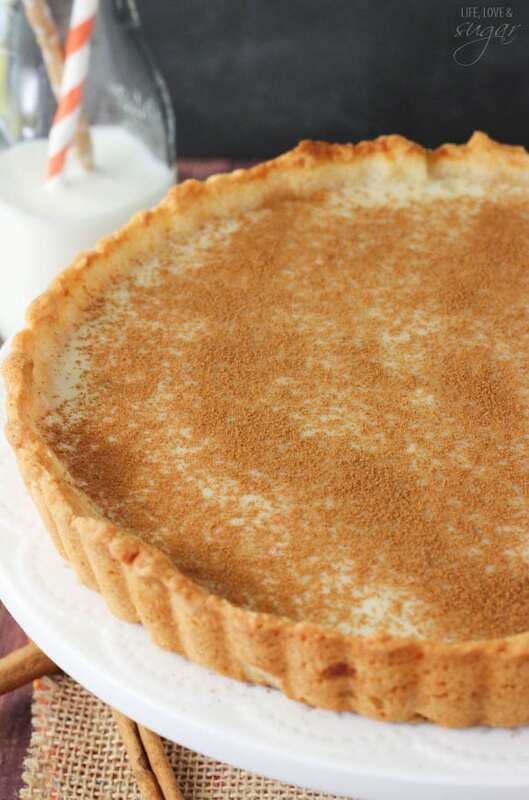 Though more work than some, this Milk Tart is seriously so good. The hubs thought it was spot on and was happy to taste test. 🙂 Our church group got to taste test as well and were big fans! One guy in particular just about ate the entire thing himself. A traditional South African dessert. 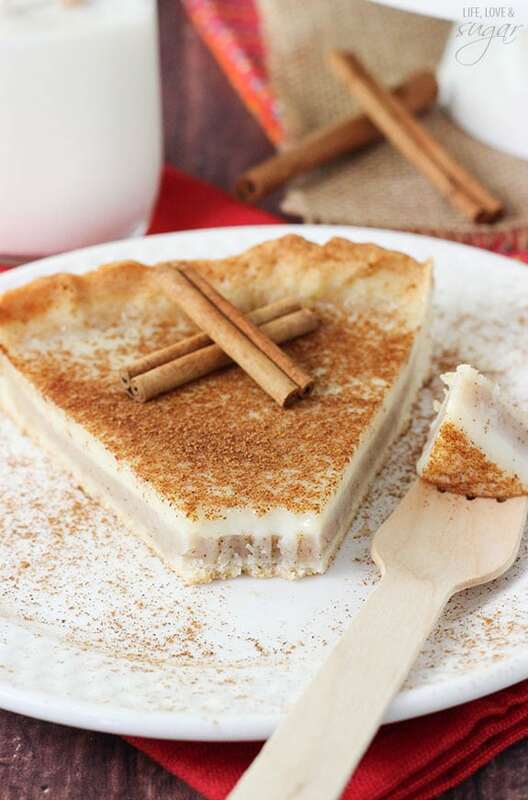 The crust is a soft, cakey crust topped with a cinnamon infused milk custard. 2. To make the crust, cream the butter and sugar until light in color and fluffy. 3. Add egg white and beat until well combined. 4. Add baking powder and flour and mix until combined. Dough will be sticky. 5. Press dough into the bottom and halfway up the sides of the tart pan. You can flour your fingers to help with the stickiness. The dough will make a very thin covering, but expands quite a bit, basically doubling in size, while it bakes. The dough should expand all the ways up the sides of the pan. 6. Cover the crust with aluminum foil sprayed with non stick spray. Top the foil with parchment paper and pie weights. 7. Bake crust for 7-8 minutes. 8. Remove crust from oven, allow to cool for 2-3 minutes, then lift pie weights out with the parchment paper. Then carefully remove the foil. 9. To make the filling, heat milk and vanilla extract to a light, rolling boil on medium heat, stirring occasionally. 10. Lightly beat egg in a separate, medium-sized bowl. 11. Temper the eggs by adding a little milk to egg mixture and stirring, then adding a little more. 12. Add remaining milk and stir until combined. 13. Add remaining ingredients and stir until well combined. 14. Carefully pour filling into crust. I suggest pulling the middle oven rack halfway out, placing tart pan on rack, then slowly adding filling. The filling is pretty thin and can slosh around easily. 15. Bake for about 25-30 minutes, adding a crust shield about halfway through so the crust doesn’t burn. The center will still be a little jiggly when done. 16. Cool tart on counter for about 30 minutes to allow it to cool slowly. 17. 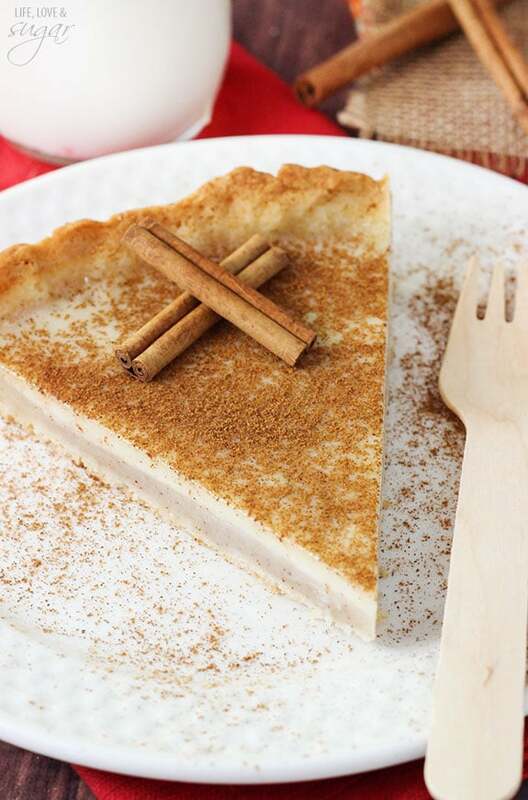 Finish cooling tart in fridge, then sprinkle with cinnamon. Recipe modified from Just Easy Recipes. 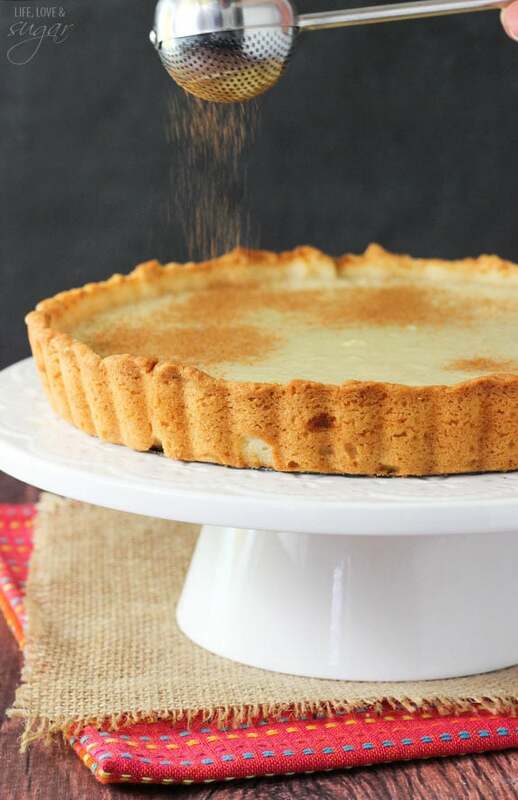 Okay, now you’ve added milk tart to my list of desserts to try immediately. I’m scared to make the crust, but we’ll see what happens! I love the way it looks, for sure! 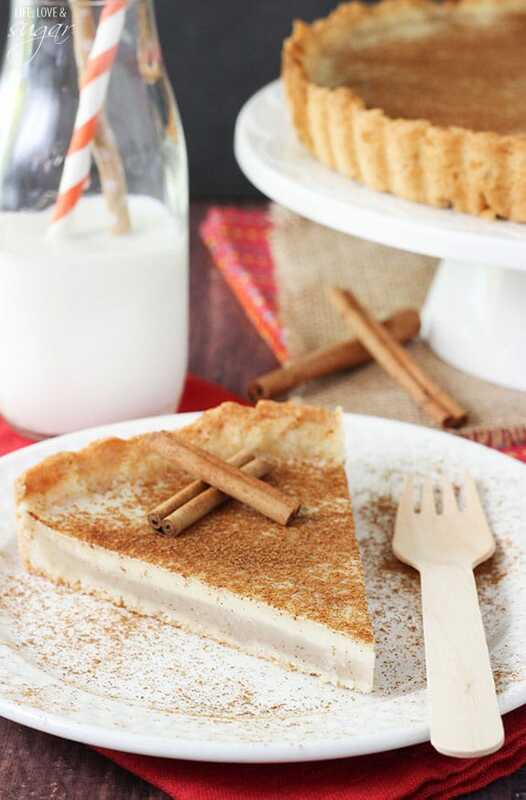 This milk tart sounds so wonderful. 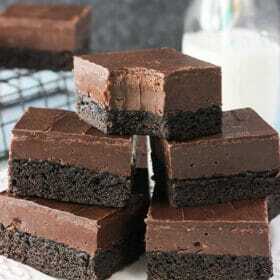 The filling looks so creamy. I can’t wait to make it! I am super impressed with you ability to match a dessert you had in South Africa! 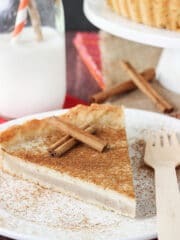 Milk tart is delicious, I only had one chance to try it and I loved it. Thanks for the recipe, will try to make it some day! Could this be made with almond milk? I would think so, though it would change the flavor a bit. The crust turned out HORRIBLE. The filling is alright but if you want a decent tart I suggest try a shortbread crust instead. The crust turned out eggy and was extremely slow to cook. The crust can definitely be tricky. I never found it to be slow to cook though. Certainly a shortbread crust would be an easier way to go and I’m sure it’d be delicious. We tried baking these three times and all of them turned out bad! They were all watery and wouldn’t harden up after a week in the fridge. I know I didn’t do anything because we followed every step in the recipe. I give this recipe a 1/10 for disappointment.